There's a new Free Friday coupon out! 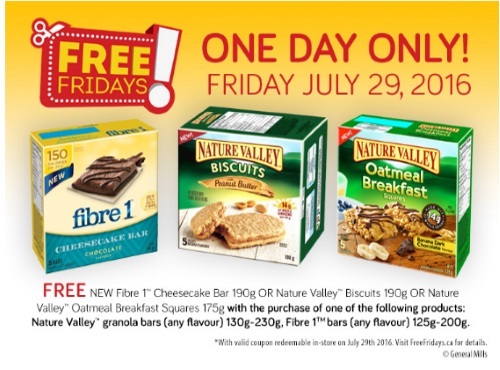 Get a Free Fibre 1 Cheesecake Bar 190g or Nature Valley Biscuits 190g or Oatmeal Breakfast Squares 175g when you buy a select General Mills product. Please note this coupon is only redeemable on Friday, July 29, 2016. This coupon is also available from the Walmart coupon portal if you want another one here.